Dragon Strand Dragon Strand Investigative Report: Rack Abuse!! Dragon Strand Investigative Report: Rack Abuse! Please calm yourself. We understand your dismay. Obviously, what we see here is flagrant rack abuse. 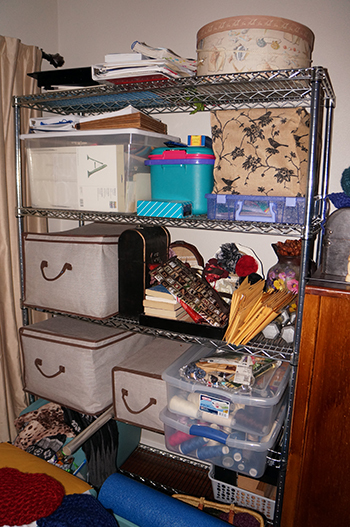 Hidden beneath those boxes and objects is a common 18” wire rack shelving system (which can be found in Home Depot, Costco, Amazon, eBay, and a myriad of other retailers). It is obvious: that rack is misused and miserable. This story has a happy ending, though. Due to our tip off and a loving intervention by the dubia, the owners of this rack did some research and came to the obvious conclusion that these racks are happiest when holding a chameleon breeding group. 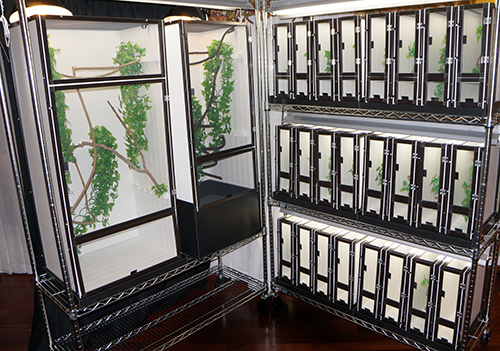 See the rack today below holding a complete clutch of individually housed panther chameleon babies next to a new rack friend holding cages for the breeding pair. This is the proper use of these wire rack shelving systems! You can just feel the contentment radiating from the shelves. You very well may have witnessed, or have unwittingly participated in, rack abuse of this nature. There are things you can do about it. First, you must immediately free the poor rack. Remove all the oppressive, ugly boxes off it’s shelves. Stack the discarded items neatly in the corner. Your significant other may take a little longer than you to appreciate your “rack liberation” program. Be patient. It is a process. But when they see a nice, neat, organized chameleon care set-up or breeding project how can they help but to recognize that this is for the best? Your genius is sure to be noted (eventually). 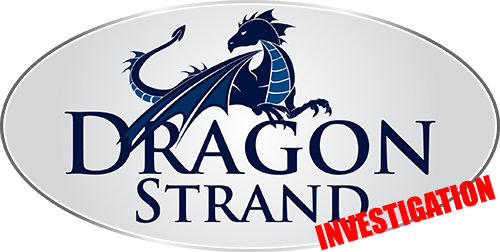 This is Thor signing off with this latest Dragon Strand Investigative Report. Until next time, Stay safe and keep your chameleons strong!